One of our good friends, Kalani, has such a great blog-- it's a gold mine of resourceful and inspiring content. I've known Kalani since I was a baby and I can't remember a time when she wasn't doing something cool, creative, fun, or inventive. She lives in L.A. and I am so glad she has a blog that we can keep up with and be inspired by on a daily basis. Head over there! How to sell your furniture fast on Craigslist. 10 steps on how to write a great Craigslist ad. 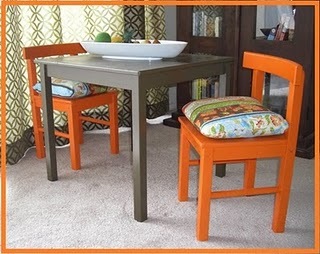 Cutest revamp of kids table and chairs! Awww,thanks for the mention! You are so kind!